With plans for private butlers, poolside villas and a nightclub called The Whale Club, condo tower Vegas 888 promised the flash and opulence of a high-roller lifestyle. But like countless other plans from the bubble era, the project flopped – and now, the vacant site has sold at a steep discount from the boom years. Las Vegas investor Christopher Beavor on Friday bought the property, at the southwest corner of Flamingo Road and Valley View Boulevard, for $13.5 million, Clark County records show. The 8.6-acre parcel is next to the Palms and across from the Gold Coast. The fenced-off site can be easy to ignore when driving past it. But its history all but epitomizes the real estate craze and crash of last decade – a Florida developer, with funding from Lehman Brothers, set out to build a luxury Las Vegas high-rise and lost the land to foreclosure. Beavor, managing partner of CAI Investments, said he hasn’t finalized his plans. But he’s considering developing retail space, a five-story apartment complex with about 280 units, and, “unless somebody writes me some silly offer tomorrow,” a nongaming hotel with maybe 200 to 225 rooms. He aims to start construction in six to seven months, he said. CBRE Group brokers had been trying to sell the site, a mile west of the Strip, for more than a year. Listing broker Michael Parks said the seller, the remains of former powerhouse investment firm Lehman Brothers, fetched the “highest price” possible but previously wanted more than what buyers would pay. He said apartment developers showed interest in the site – that sector is among the busiest in Southern Nevada commercial real estate, with rising rents, shrinking vacancies and a burst of construction, mostly in the suburbs. 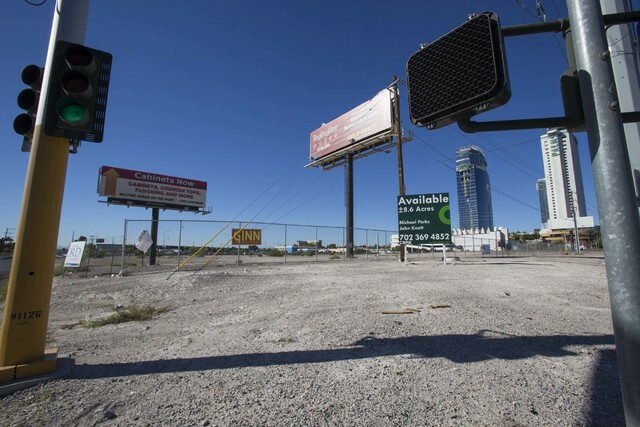 As far as he knew, the Flamingo parcel was Lehman’s last remaining asset in Nevada, but it wasn’t “a fire sale.” Apartment developers who eyed the property wouldn’t pay a high-enough price for Lehman, according to Parks. Lehman Brothers Holdings spokeswoman Kim Macleod declined comment on the sale. No one is building condo towers in Las Vegas today, but last decade, with easy credit sloshing around for homebuyers and developers alike, investors drew up plans for dozens. Supporters dubbed the high-rise boom the “Manhattanization” of Las Vegas. Christopher DelGuidice was one of many developers who got in on the go-go years. The founder of Orlando, Florida-based Del American Real Estate Group, DelGuidice developed Vegas Grand, a luxury residential project east of the Strip on Flamingo, with Lehman financing. After he launched that project, his company announced plans in 2005 for Vegas 888, a 50-story luxury condo tower. He bought the Vegas 888 site for $50 million in 2004, backed by a loan of up to $79.45 million from Lehman, county records show. According to the 2005 announcement, the planned amenities included a 12,000-square-foot spa; private butlers, housekeepers and other staff “whose sole mission is to anticipate and fulfill every desire of each resident”; and The Whale Club, an “exclusive” nightclub with views of the Strip. By 2006, however, far more condo towers had been announced than built in Las Vegas, and cancellations and litigation were mounting. Del American unveiled a change in plans that year, saying the “best use” for the Vegas 888 site was a luxury casino-resort. The property, however, was seized through foreclosure in 2007, county records show, and New York-based Lehman went bankrupt in 2008, helping trigger the U.S. financial crisis. In a phone interview Tuesday, the 59-year-old DelGuidice said he pre-sold about $250 million worth of condos at Vegas 888. But planned high-rises were being scrapped amid rising construction costs, he said, and prospective buyers eventually stayed away because they didn’t know if projects would get built. He said his group spent about $75 million on Vegas 888. He declined to say how much he lost on the project but said most of the money spent came from Lehman. “That would have been the hottest building ever,” DelGuidice said. He also said he looked into buying the site back a year or so ago to develop apartments, but it was priced at $20 million, and rental rates weren’t high enough to make a project there work. He still visits Las Vegas. But given what happened to his boom-era projects here – Vegas Grand was hit with litigation after DelGuidice raised the sales prices, news reports said, and this week he called that project a “big calamity” – at least one thing seems certain. Contact Review-Journal writer Eli Segall at (702) 383-0342 and on Twitter at @eli_segall.